BACKGROUND: The Anti-Inflammatory Diet (IBD-AID) is a nutritional regimen for inflammatory bowel disease (IBD) that restricts the intake of certain carbohydrates, includes the ingestion of pre- and probiotic foods, and modifies dietary fatty acids to demonstrate the potential of an adjunct dietary therapy for the treatment of IBD. METHODS: Forty patients with IBD were consecutively offered the IBD-AID to help treat their disease, and were retrospectively reviewed. Medical records of 11 of those patients underwent further review to determine changes in the Harvey Bradshaw Index (HBI) or Modified Truelove and Witts Severity Index (MTLWSI), before and after the diet. RESULTS: Of the 40 patients with IBD, 13 patients chose not to attempt the diet (33%). Twenty-four patients had either a good or very good response after reaching compliance (60%), and 3 patients' results were mixed (7%). Of those 11 adult patients who underwent further medical record review, 8 with CD, and 3 with UC, the age range was 19-70 years, and they followed the diet for 4 or more weeks. After following the IBD-AID, all (100%) patients were able to discontinue at least one of their prior IBD medications, and all patients had symptom reduction including bowel frequency. The mean baseline HBI was 11 (range 1-20), and the mean follow-up score was 1.5 (range 0-3). The mean baseline MTLWSI was 7 (range 6-8), and the mean follow-up score was 0. The average decrease in the HBI was 9.5 and the average decrease in the MTLWSI was 7. 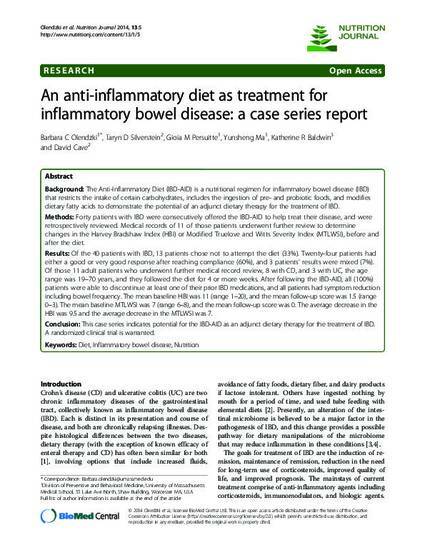 CONCLUSION: This case series indicates potential for the IBD-AID as an adjunct dietary therapy for the treatment of IBD. A randomized clinical trial is warranted. © 2014 Olendzki et al. ; licensee BioMed Central Ltd. This is an open access article distributed under the terms of the Creative Commons Attribution License (http://creativecommons.org/licenses/by/2.0), which permits unrestricted use, distribution, and reproduction in any medium, provided the original work is properly cited.